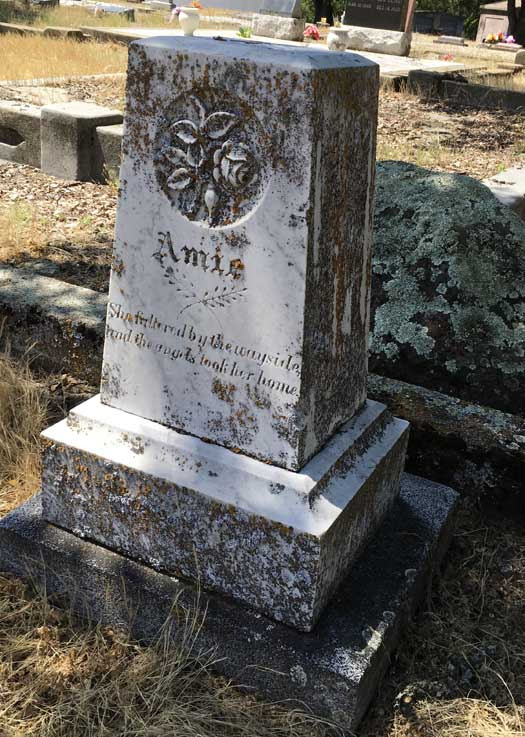 Visit a historic old graveyard in Mother Lode Country to see the — roses?!? You bet! Pillars at the entrance to Plymouth Pioneer Cemetery bear engraved plaques with names of early pioneers and military veterans who are buried here. Local volunteers banded together to “rescue, preserve and protect” these heritage roses so future generations can enjoy them. And they had quite a time with the “rescue” prong of their mission! Buds were just starting to open when we visited in late April. How amazing to see a rose developed in China pre-1835 — and so loved that later generations kept propagating it! In the past, well-intentioned groundskeepers applied herbicides to the cemetery grounds and — yup, the antique roses too got sprayed. Sadly, some century-old rose bushes never made it. 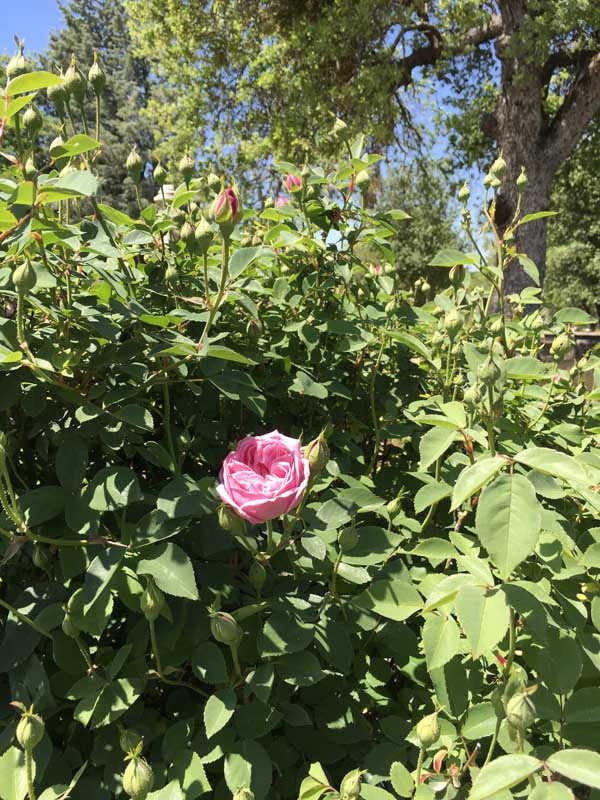 Then in 2014, the curator of the San Jose Heritage Rose Garden reached out to local residents to try to save the remaining heritage roses at Plymouth Cemetery. Thanks to the care of these dedicated volunteers, the cemetery’s antique rose bushes are thriving again — and what a treat for the eyes they are! Pioneers lugged these heritage roses here to the Mother Lode. Some made the journey tucked in covered wagons, while others spent months in the dank, dark recesses of sailing ships. Once here, the beautiful flowers became important reminders of home. Treasured for their heady fragrance and beautiful shape, roses were also planted as a special tribute at a loved one’s grave. 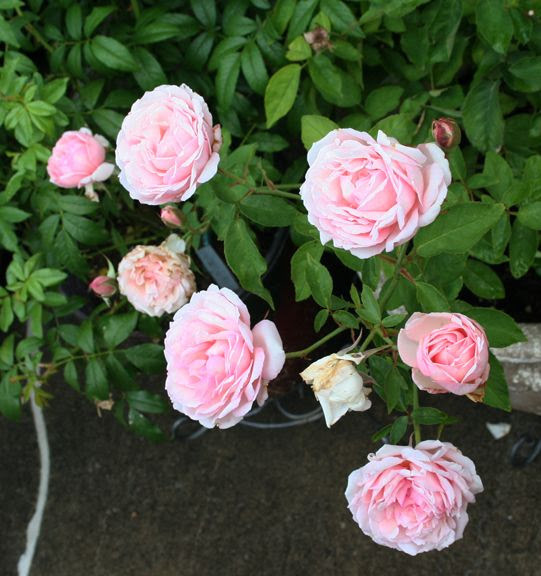 Roses can be propagated from a cutting, with “babies” retaining the same characteristics as the mother plant; identifiable varieties can be traced back hundreds of years. Here at Plymouth Pioneer Cemetery, rose varieties include the Duchesse de Brabant— a long-flowering “tea rose” dating to about 1857. Drought-tolerant and vigorous, this rose was said to have been a particular favorite of Teddy Roosevelt. The “Pulich Children” rose from the 1860s. 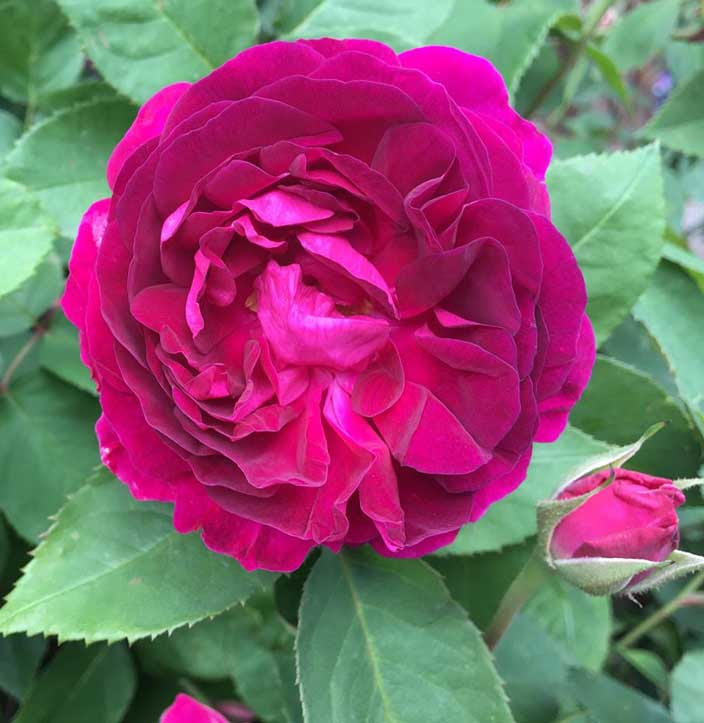 A gorgeous deep-pink hybrid known as the Pulich Children rose dates back to the 1860s. 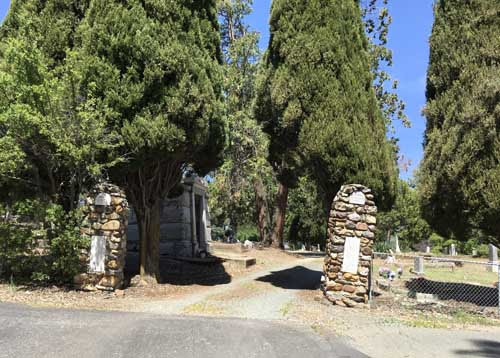 Cuttings propagated from a bush here at Plymouth Pioneer Cemetery have produced bushes that now grace other gardens, including the Howard Rose Garden at the Banning Museum in Wilmington, California. 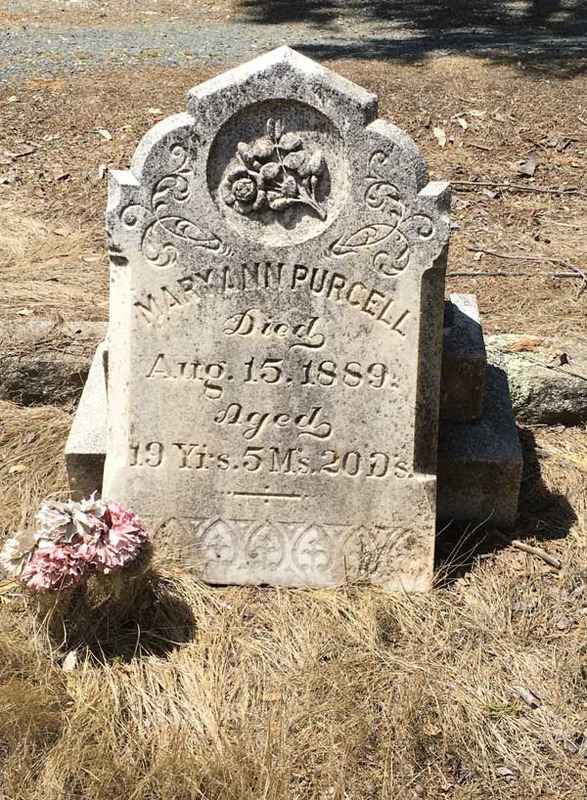 Maryann Purcell died in 1889, just 13 years old. An engraved rose tops her headstone. The Gold Rush town of Plymouth isn’t alone, of course, in having spectacular old roses in its cemetery. Sacramento, too, has a rose garden associated with an early cemetery. The collection of roses at Sacramento’s Old City Cemetery is said to be “among the world’s best,” boasting over 500 rare rose specimens from between 1850 and 1915. Many were collected and propagated from specimens at other old cemeteries and early homesites. Check them out here: http://oldcitycemetery.com/roses.htm. And for a wonderful story about how this special rose collection narrowly escaped being regulated out of existence: http://www.sacbee.com/news/local/article142206839.html. And if you’re a true rose afficionado, there even a “ Mother Lode Rose Society” you can join in Jackson. The Pentecost Rose — not really a rose at all, but a peony. 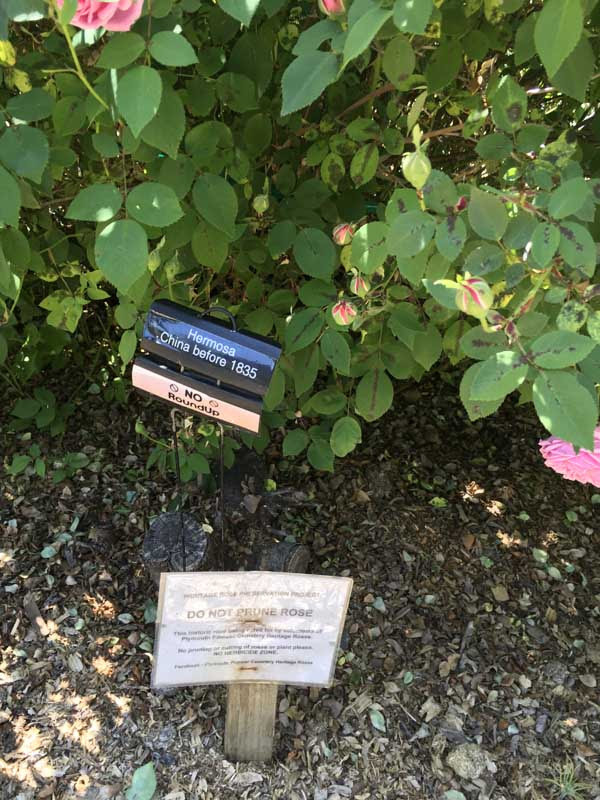 Carson Valley, too, had its own old rose bushes — including a heritage “rose” that isn’t really a rose at all. 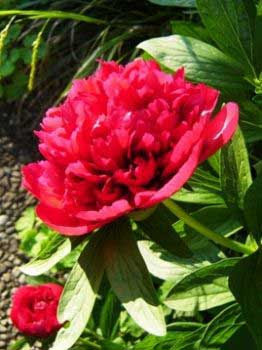 Many early homesteads were brightened by the deep red, rose-like “Pentecost Rose” peony — tubers of which are said to have first been brought to Carson Valley by Anna Neddenriep, all the way from her home in Germany. From Jackson, go north on Hwy 49 through Sutter Creek and Amador City to reach the town of Plymouth. You’ll come to a stop sign; continue through for a short distance, then turn right on Church Street. Cross Landrun and keep going; the road will take you up a hill and jogs left; the cemetery entrance is on your right. Don’t forget that selfie with a rose bush — share your history adventure with your friends! Enjoyed this story? Please SHARE it on Facebook! And if you’d like to read more Sierra history stories like this, hot off the presses, sign up for our free history newsletter at the top right of this page!